Learn technical and practical skills useful in pursuing a career in front or middle office positions. 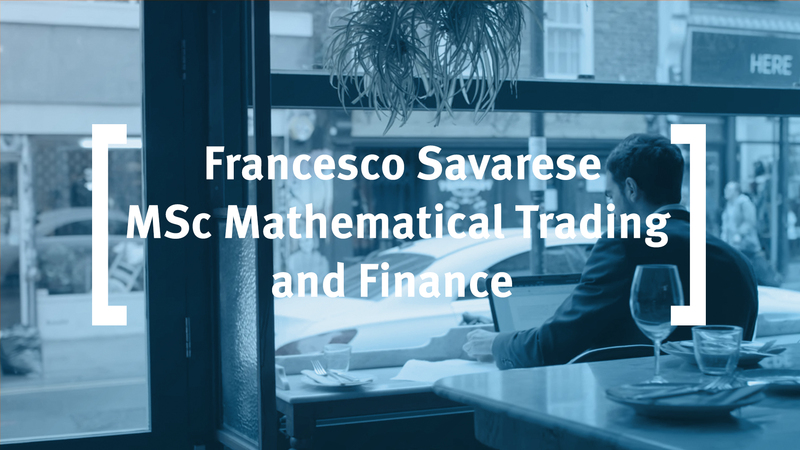 Francesco Savarese studied on the MSc in Mathematical Trading and Finance at Cass Business School. In this video he explains how Cass is for the ambitious and helped him to achieve his career goal to become a trader. To successfully complete this Mathematical Trading and Finance master’s course, you must have a good understanding of mathematics. You may well have studied finance, economics, engineering or maths or physics as an undergraduate. Or you might have a bachelor’s degree in a science subject, in particular computer science. You should have a general interest in mathematics and statistics. You should have a general interest in learning the more technical and mathematical techniques used in financial markets, but you don’t need to have a background in finance. The difference between the MSc Mathematical Trading and Finance to the other two quants courses (MSc Financial Mathematics and MSc Quantitative Finance) are core modules which focus on quantitative trading and structuring. You’ll study core modules which focus on the theory of finance and different financial assets. You will look at how these assets are priced and used for asset management or risk management purposes. The second type of core modules cover the mathematical and statistical aspects needed in quantitative finance, including some stochastics. This also includes learning some programming languages, in particular Matlab, but also VBA. Finally, Term three offers you flexibility within your masters; either by writing a dissertation or undertaking a project. You can complete your postgraduate degree entirely choosing electives. Chat to one of our MSc in Mathematical Trading & Finance students now and have them answer your questions on everything from application to student life. markets, starting from the financial theory, looking at different financial instruments and showing various applications of the theoretical concepts. You will gain a good understanding of stochastics, mathematical finance and econometrics as well as some programming. You will also obtain a very good understanding of different financial assets, in particular derivatives, and how they can be used in different context, such as risk management, asset management or structuring. The MSc Mathematical Trading and Finance programme will also help you do understand the financial theory used in financial markets with an emphasis on practical applications. You will three different possibilities to complete your degree in the third term, including writing a dissertation or an applied project. electives include Behavioural Finance, Trading and Hedging in the FOREX Market, Technical Analysis, Hedge Funds or Python. This module focuses on the introduction of pricing financial securities, which forms the basis for understanding asset pricing behaviour and the cornerstone of many asset pricing models. The focus is on spot securities, mainly equities and debt instruments. The module also introduces students to the fundamental theory used by practitioners and academics in the wider field of finance, in particular asset management. That includes portfolio theory, the CAPM, factor models and measuring risk and return. Those concepts are widely used by financial market participants. At the end of this module the various building blocks are being put together in the discussion of performance and persistence of performance of mutual funds. To introduce derivatives and derivative models in the context of financial risk management. To complement general finance courses with specific instruction in the key derivatives area. To enable you to use models in this area in practical applications. To transmit to you the fundamental mathematical modelling techniques underpinning the subject. The course provides the essential statistical and econometric techniques needed to conduct quantitative research in finance and economics. This combination of econometric theory and application will enable you to understand and interpret empirical findings in a range of financial markets, including reading of empirical academic literature and critical assessment econometric applications undertaken by industry practitioners. The module provides the necessary mathematical tools on which the entire programme is based. To learn fundamental numerical methods for simulating trajectories of commonly used stochastic processes. Strong research skills are a key element of development strategy for companies and institutions large and small. In particular the ability to programme and to automate procedures. This module focuses on MATLAB and VBA as a programming language. The module introduces the main programming skills which are helpful in the financial industry. Operating on matrices or arrays, loops, subroutine and optimisations are core skills which are being introduced in this module. To provide a foundation in a crucial area of financial markets and quantitative finance. To complement the general derivatives course with specific instruction in a key derivatives area. To acquaint you with the main modelling streams in fixed income securities. To enable you to use models in this area in practical applications. To transmit to you the fundamental mathematical modelling techniques underpinning the subject. Financial disasters are a constant reminder of the relationship between financial risk and reward. The quantitative approach to this relationship is ever more dominant in the market and subject to constant innovation. As market participants need to keep abreast of new developments, the Risk Analysis module provides a good path of study in this field. The aim of this module is to help you develop a solid background for evaluating, managing and researching financial risk. To this end you will learn to analyse and quantify risk according to current best practice in the markets. This trading focused module introduces students to the world of computer-based trading and dealing with high frequency data. Some relevant market microstructure concepts, such as bid-ask spreads, liquidity and other concepts are being introduced before the focus moves to high frequency trading strategies and other automated trading concepts. This module provides on overview of machine learning concepts, techniques and algorithms used in practice to describe and analyse complex data, and design predictive analytics methods. You should expect to engage with the main idea and intuition behind modern machine learning tools from a practical perspective. Standard computing skills in R,Python and Matlab will be used to put in practice the theory discussed during the lectures. You may choose from the three options in your final term. Option 1: Students can take five specialist elective modules (5 x 10 credits). Option 2: Students can opt to write a 10,000-word Business Research Project (40 credits) and take one specialist elective module (1 x 10 credits). 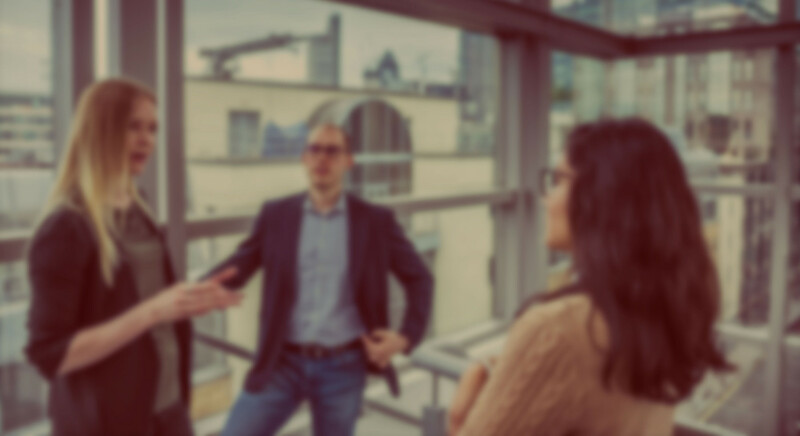 It is important for aspiring professionals to demonstrate, on an individual basis, their ability to apply concepts and techniques they have learned in an in-depth study of a topic of their choice and to organise their findings in a report, all conducted within a given time limit. To train you to undertake individual research and provide you with an opportunity to specialise in a contemporary business or finance topic related to your future career aspirations. You are required to submit a project of approximately 10,000 words on any subject area covered in the rest of the programme. Typical projects can involve any of the following: extracting data from electronic databases or by hand; statistical analysis of large or small populations; interviews; case studies of an industry or a sector or of a business / finance issue in a particular country setting. The aim of this module is to enable you to demonstrate how to integrate your learning in core and elective modules and then apply this to the formulation and completion of an applied research project. You will be required to demonstrate the skills and knowledge that you have acquired throughout your MSc study. You will undertake a short piece of applied research on a question of academic and/or practical relevance. Guidelines will be provided in order to help you identify the research question. Based on your chosen topic, you must write a report of around 3,000–5,000 words that summarises and critically evaluates your method and your findings. See the MSc in Mathematical Trading and Finance programme specification. Assessment of modules on the MSc in Mathematical Trading and Finance degree in most cases, is by means of coursework and unseen examination. Coursework may consist of standard essays, individual and group presentations, group reports, classwork, unseen tests and problem sets. Please note that any group work may include an element of peer assessment. an introduction to careers in finance and the opportunity to speak to representatives from over 75 companies during a number of different industry specific fairs. a reminder course of advanced financial mathematics, statistics and basic computing which forms a prerequisite of the core modules in term 1. This knowledge and experience inform the highly interactive lectures that make up the MSc in Mathematical Trading & Finance. Your academic background should be in a highly quantitative subject such as mathematics, physics, engineering, economics or computer science and having covered areas such as statistics, linear algebra and calculus. The required IELTS level is an average of 7.0 with a minimum of 6.5 in the writing section and no less than 6.0 in any other section. The job opportunities for students from the three quants master's programmes are very similar. They usually find employment with large investment banks, but also some smaller boutique finance firms, hedge funds or other specialist companies. Working as an analysis or quantitative analysts, in risk management, on fixed income security desks or in the asset management industry including hedge funds are typical jobs for students from the MSc Mathematical Trading and Finance degree. Some students also secure positions on trading desks. You will also have the skills to study for a PhD in the area of quantitative finance and financial markets.